This undated, unused postcard shows monkeys during feeding time at the Hershey Park Zoo in central Pennsylvania (now ZooAmerica). 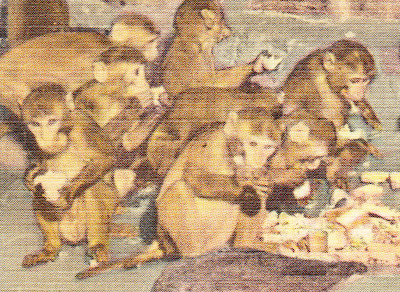 The Otto family believes that these monkeys are members of the macaque subfamily. Another possibility is that they are mangabeys. 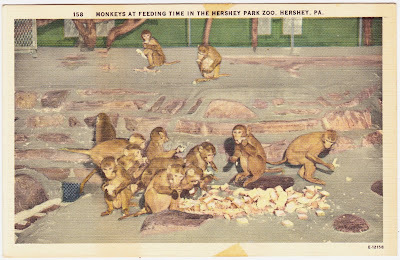 "The monkeys are a great attraction for children and adults; admission to the Zoo is free. The Pennsylvania Game Commission presents a large conservation exhibit." Back in the day, one of my first blogging endeavors for the York Daily Record/Sunday News1 involved an attempt to secure a Pulitzer Prize by posting "Gratuitous Monkey Photos." Some of those blog entries are still accessible, and you can see a directory of them here. 1. My very first work-related blog was for coverage of the Philadelphia Eagles in Super Bowl XXXIX in early 2005.